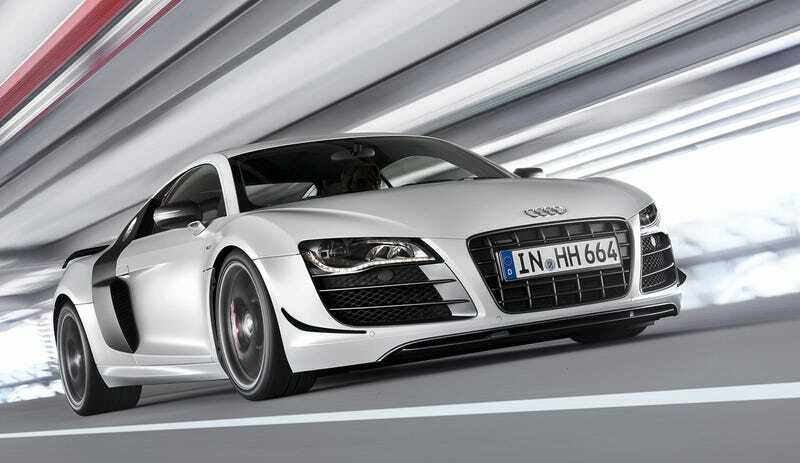 The Audi R8 GT gives Ingolstadt's übercar the 560 HP and 398 lb-ft of torque to match the Lamborghini Gallardo LP560. Its production run of just 333 units — half the mark of the beast — gives it demonic powers! The modified 5.2 FSI V10 looks hotter thanks to the dark red cylinder head covers, and backs up the new appearance with a more aggressive tune good for the 35 HP boost. Envisioned for track duty there's an optional race package with bolt-in rollbar, four-point harness, racing extinguisher and kill switch. To reduce weight engineers said "no" to second helpings of schnitzel all winter. To reduce the car's weight they added thinner glass, more polycarbonate parts and shaved whatever they could out of the lightweight aluminum body. The total package comes in at a relatively svelte 3,582 pounds with the Quattro and R-tronic (sorry, only automagical action for you). The only thing that isn't better is the price, which comes in at €193,000, or $255,000 in our devalued American currency. We're hoping that number includes ridiculous European taxes so our price is lower if it comes stateside. According to Audi's Christian Bokich that decision has yet to be made, but America hasn't been ruled out yet as a market. If you want one just be really nice to any German people you might chance to meet in the hopes they're Audi employees.